Tintin Heart: Winter and Snowmen - Ditzy-Craftymessers Challenge. 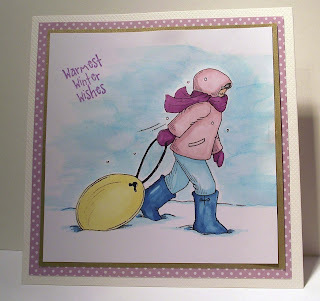 Winter and Snowmen - Ditzy-Craftymessers Challenge. Here is my DT post for the new challenge running over at Ditzy-Craftymessers Challenge is being sponsored by Robyns Fetish Digital Stamps. Robyns Fetish Digital Stamps provided the DT with some sample images and I chose the image of the child in the snow with the sleigh. We see a lot of this here in our part of Germany and the kids are all wrapped up and having so much fun, the sheer joy is contagious. This image reminded me of the fresh, bright sunny days and the squeals of the children as they race down the hill at the back of the house. Great! My new set of Copic makers came in handy for this project. The coloured image was matted onto some light paper in gold and then on to a complimentary pink polka-dot paper. The white 15 x 15 cm base completed the card. The sentiment is from a freebie stamp set from a craft magazine. Thanks for stopping by to read my blog. Don't forget to leave a comment; I love hearing from you.